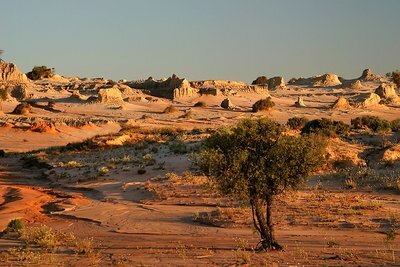 A foundational project is currently underway at Lake Mungo (Australia) and those lakes that abound it to document the history of human settlement, past environmental change and landscape evolution that has occurred in this area. This immense undertaking comes after a long hiatus of research being conducted here and hopes to provide the first systematic archive of its archaeological traces. Documenting the history of human settlement seems like an epic task in any part of the world; in the stark beauty of the Willandra Lakes World Heritage Area, it involves tracing back no less than 45,000 years. Upon arriving to the now dry lake bed which lies at the heart of Mungo National Park, it is not hard to appreciate the ancient nature of this part of the world – it is one of the oldest places outside of Africa to have been occupied by modern humans. The site of the world’s oldest known cremation and ritual ochre burial, as well as the longest trail of ancient human footprints, surprisingly little is known about the people who lived here. Enter La Trobe University’s palaeolithic archaeologist, Dr Nicola Stern, whose Mungo Archaeology Project hopes to redress this shortfall in our collective knowledge. “There’s an untold story at Mungo; Mungo is famous because of Mungo Lady, Mungo Man; a trail of fossil footprints,” says Dr Stern. The Mungo lunettes are half-moon shaped sand dunes built from ancient layers of the earth’s surface and form the ‘Walls of China’ – a major drawcard for visitors to the World Heritage site that is Mungo National Park. Containing rich deposits of information, the lunettes have preserved hundreds of rare, snapshot images of Australia’s earliest history and provide a unique record of the ways in which the first settlers may have adapted to the changes to their climate over time. They form the basis for Dr Stern’a foundational research into this narrative of human evolution. “It’s the foundation – there’s a lot that we could do if we had already had this information,” she says. It is not only the scientific community who have longed for this work to be done; elders from the region’s Aboriginal tribal groups are also supportive of the project and are working in collaboration with Dr Stern’s team to monitor it. With such an endeavour, Dr Stern has a loyal team of around 20 others working with her and says there will be more to come on board in the future.